The Hurricane (often simply the Cane) has a long history of positive PvP and PvE performance and is one of the most versatile ships in the game. It can deal impressive DPS and can be shield or armor tanked. Most Minmatar pilots choose a Hurricane as their L3 mission ship, fitting either a passive shield tank or an active armor tank. In PvP the Hurricane can be fitted as a simple, armor-buffered short-range bruiser; a fast shield-tanked "Nanocane"; or as a shield-tanked, medium-range high-alpha artillery platform. 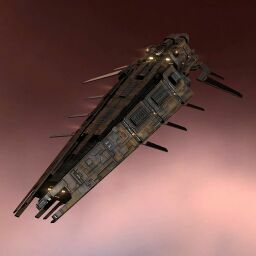 Roaming gangs of shield tanked Hurricanes with Scimitar logistic support are a fearsome sight and a highly effective combat fleet. Minmatar Battlecruiser to at least IV to properly take advantage of the Hurricane's massive DPS buff that comes with every extra level in the skill. Gunnery V, Medium Projectile Turret V and Medium Autocannon Specialization/Medium Artillery Specialization trained to at least I to fit T2 guns, which do more damage and are substantially cheaper than the meta 4 variants, along with the ability to use T2 ammo types. Rapid Firing, Surgical Strike, skills which increase DPS and are thus vital to all turret-based damage dealing ships, should all be trained to at least IV. Along with the obvious Engineering and Electronic Systems fitting skills required for fitting most ships, Weapon Upgrades and Advanced Weapon Upgrades should be trained to V and at least II respectively to help alleviate fitting problems associated with the ship's powergrid. Sharpshooter is important for artillery fitted Hurricanes, though due to autocannons' small optimals it isn't as important for autocannon fits. Drones V, Light Drone Operation V, Drone Interfacing IV and Gallente Drone Specialization I/Minmatar Drone Specialization I are all are important for getting as much DPS out of the 40m3 drone capacity as possible. The appropriate skills required for fitting a Full T2 Armour or Shield Tank. No sub-article about Hurricane roles or piloting tactics. You can write them here. The Feb 2013, Retribution 1.1 patch removed a high slot that had often held an energy neutralizer. This left it with one utility high slot. It is also had a slight reduction in hitpoints, and an increase in mass that was intended to slow down align times by two tenths of a second. For artillery you most likely need Power Diagnostic Systems, Reactor Control Unit modules or Powergrid implants. Retribution 1.1 Deployed on Tuesday, 19th of February 2013. Hurricane turrets have firing arc that will no longer clip the geometry. The powergrid output of the Hurricane has been reduced to 1125. This page was last modified on 25 February 2019, at 08:55. This page has been accessed 323,569 times.